* All units in the Nautican Army have the Seaborn rule except for Sandgangers which come from the shores and not the seas. Special Characters have the seaborn rule if noted in their profile. * if both armies have sacrificed the option to choose who goes first then roll a D6 as normal. Gunpowder weapons do not work on a D6 roll of 6* (test for each weapon fired). At the very beginning of each Nautican magic phase, the Nautican player can cast a bound (power level 6) lightning strike spell *** on one enemy unit which inflicts D6 str 4 hits. * The storm has made the gunpowder wet. ** Test against the lowest str model in the unit, eg. a unit with a lowest str of 3 can march move on a d6 dice roll of 1-4 (str+1), a roll of 6 is always a fail and prevents the unit from performing a march move. (note: Dwarf ground troops are resolute and can always march move). 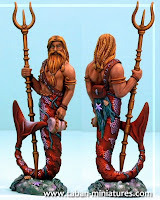 The sea storm is automatically and immediately dispelled if the Chanty Singer battle standard bearer is removed as a casualty. The Nauticans are comprised of Creatures and Nautican peoples from across the oceans, from the deep to the very shores of their surface dwelling enemies. The sea people unite to protect their common interests, the creatures are bound by Nautican magic to serve their Nautican masters. Both creatures and peoples have different origins, these origins affect their natural abilities and translate into very disparate battlefield abilites. All Nauticans* are either from the Deep, the Reefs or the Shores. * The Sea Creature Origin rules do not apply to all Special Characters (see their respective profiles). The Nauticans of the deep oceans live in an extremely inhospitable environment. The They are plagued by denizens of the deep spawning around chaos vents leaking twisted magic into the seas. These Nauticans are the most resilient of the Nautican creatures and their bodies have adapted to heal quickly. The Reef dwellers live in symbiotic harmony with the living coral about them. They are at one with the conditions and they carry with them the magical essence of the coral environment. On land, the living coral will form around "Reefers" who do not move. This provides some protection from missile fire and makes "Reefers" move difficult to shift in close combat. Creatures of the Reef gain +1 to their combat resolution* as coral forms around them and they become more difficult for the enemy to dislodge. * This benefit does not apply in the first turn of combat if the Reefer unit charged into combat. The shoreline dwellers that reside in coastal inlets and shores are at one with tidal magic. They move easily and quickly adapting to the changing tides and are ever the most battle ready of all Nautican units. *not including special characters. Sea Creature Rules are noted in the Special Character's profiles where applicable.